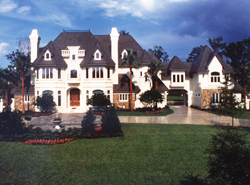 Luxury house designs give homeowners a grand lifestyle. These homes feature large floor plans in a variety of architectural styles, including Traditional, European, Victorian, Colonial or Mediterranean. Many luxury homes include formal and informal living spaces, guest suites, 3-car garages, pools, several bedrooms and baths, a study or library, media rooms, and bonus space to be finished as desired for your family. As luxury is subjective, we have incorporated a vast variety of house styles and sizes into this collection of dream luxury style homes. The Wrights Creek Craftsman Home has 3 bedrooms, 2 full baths and 1 half bath. 2735 Sq. Ft., Width 72'-0", Depth 65'-6"
The Drexel European Ranch Home has 3 bedrooms, 2 full baths and 1 half bath. 3044 Sq. Ft., Width 75'-6", Depth 85'-6"
3718 Sq. Ft., Width 98'-8", Depth 75'-9"
3114 Sq. Ft., Width 68'-0", Depth 53'-6"
Explore beautiful Luxury home designs including many with photos and find a mansion, or estate home that features all of the amenities you could ever want in a dream home. Search a diverse selection of luxury plans and find the perfect floor plan to meet all of your needs.